May 31, 2018 – Last Wednesday, Salt Lake City’s FOX 13 aired a story about the topping out ceremony at Salt Lake City International Airport, where crews lifted and placed the final steel beams onto the new terminal. The building is 866,000 square feet with more than 11,000 tons of structural steel and 22 miles of steel pipes. The mayor was in attendance praising the hard work of the 1,000 plus crew members, many of whom signed the final beam, leaving their mark on this piece of history. 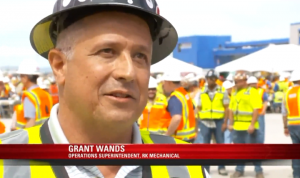 RK’s Grant Wands, SLC Airport Operations Superintendent, was quoted as saying, “Flying that last beam up… it’s a great endeavor. Not often do you get an opportunity to work on a job of this size. It’s a once in a lifetime opportunity for a lot of people.” Watch the full video here.